For over one hundred years in Ireland the teaching and living of the Catholic faith was very much suppressed by British rule. Through what were called the Penal Laws, no Catholic could own land, could be in a position of social authority, or could be instructed in the faith. Such was the situation which forced a sixteen year old Daniel Delany of Mountrath to sneak away to France in 1763 so he could study for the priesthood. He returned to Ireland in 1777 and after fourteen years of living in Catholic France he was dismayed by the poverty that existed in his homeland: the poverty of the people and the poverty of their faith. Around 1778, as a strategy to refamiliarise the people of his parish with the teachings and traditions of the Catholic Church, Fr Daniel Delany began a Sunday School. At first he taught alone, but soon volunteers presented themselves to assist in this work. From these volunteers Bishop Delany chose six women to form the Brigidine Sisters in 1807 and four men to form the Patrician Brothers in 1808. The Brothers lived as the people they ministered to: their home a hovel and their daily bread something uncertain. One Brother was able to support the community with a steady income through the pay school, but the other three Brothers had to rely on obtaining manual work. The situation soon became so chronic that Bishop Delany offered them the opportunity to disband. They continued on. Despite the hardships their numbers grew, and in February 1810 four Brothers were able to move to nearby Mountrath to begin a school there. In 1819 Galway’s bishop Nicholas Archdeacon invited the Brothers to Clarenbridge, close to the west coast, to administer a free school. It was a free school so the Brothers would have to support themselves off the land that would come with the school and as tradesmen. The school opened in 1823. From 1827 to 1980 the Brothers opened a further twelve schools. 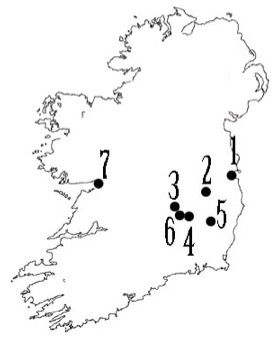 The furthest north was Carrickmacross; furthest south, Mallow; furthest east, Finglas (Dublin); and furthest west, Galway.